When the sun goes down in San Francisco, a twinkling display of lights keeps the city glowing throughout the night. 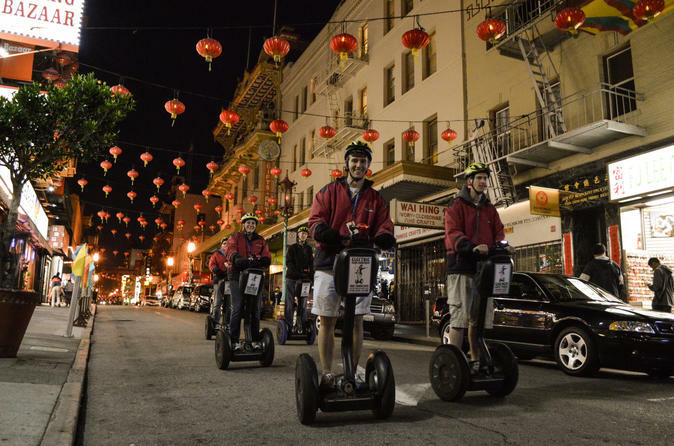 While a brisk stroll is one way to admire this nightly light show, why not cover more ground on a Segway tour of Chinatown, North Beach and the Embarcadero? It’s a rare opportunity to take this two-wheeler on the streets of some of San Francisco’s most famous neighborhoods after dark. Your guide keeps you, family and friends on track with fun trivia and facts about the sights you pass, and there are plenty of stops to take photos along the way. Join a troupe of Segway riders on Beach Street, along Fisherman’s Wharf, to gear up for your evening ride with a 20-25-minute safety orientation. Along with a helmet and safety vest, you’ll get hooked up with a radio device so you don’t miss any of your guide’s commentary along the way. Once you feel comfortable on your two-wheeler, hit the streets to see Chinatown, North Beach, Fisherman’s Wharf and the Embarcadero lit up at night. It’s a great way to see the city in a new light! Depart from Beach Street to head up to North Beach, or what locals consider the city’s Little Italy. The streets are flanked by bustling Italian restaurants, with the scent of authentic warm dishes wafting from the doorways. Imagine the Beat poets and artists who once roamed the neighborhood as your guide shares history about the counterculture movement at Washington Square Park by Saints Peter and Paul Church. Cruise over to nearby Chinatown, one of the city’s oldest neighborhoods. Along the lantern-lit streets, peer into dim sum houses, admire temples and appreciate souvenirs that dangle from windows and spill over display tables. If you visit in mid-winter, expect to see festive decorations in honor of the Chinese New Year. From Chinatown, head east toward the waterfront to take in the Bay Bridge, which appears to be dressed in tinsel; it’s actually a light sculpture known as Bay Lights. Continue along the Embarcadero past the Ferry Building to Fisherman’s Wharf for a look at the historic piers and harbors. Enjoy nighttime views of Alcatraz and Fisherman's Wharf before ending your Segway tour at the start point.